Heinz Gaube is Professor Emeritus at the Oriental Institue of the University of Tübingen. Abdulraham Al Salimi is a professor of Islamic studies at the Instiute of Shariah Sciences in Oman and the editor-in-chief of Tolerance, a journal dedicated to discussions of present-day religious and political issues. This book is a first attempt to present Omani Quranic manuscripts and their illuminations to a wider public and to discuss their originality in the wider context of Quranic manuscripts, Islamic art as a whole, and beyond that in the wider context of Oriental art in general. The art of Quran illumination developed slowly. The main reason for this lengthy process can be seen in the fear of allowing anything to intrude upon the text, which in itself differs highly from the holy texts of other religions. For a Muslim the Quran is the word of God revealed to mankind. It constitutes a kind of Divine presence. This Divine presence had theoretically to be the only source of inspiration for the artists who wrote, illuminated, and embellished the Quranic text. It cannot be “polluted” with pictures of Holy figures, special events, or so on. In which way do these specific preconditions and other criteria influence Quran illumination ? In first place we have to take into consideration that the artists who illuminated Qurans came from different ethnic, artistic, and historic backgrounds which nurtured what became a specific Islamic civilization and a specific Islamic art. And, next to the uniqueness of the text, these backgrounds were the sources of the formation and development of Quran illuminations as we can follow them up chronologically and regionally. These sources were primary Arabic and Persian : Arabic, an essentially iconoclastic or abstract concept of material representation of religious themes and ideas, and Persian, which had its origins in the Ancient Oriental and Mediterranean world of pictorial representation of religious themes and ideas. 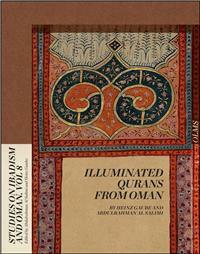 This book focuses on the most prominent components of Quran illuminations, the frontispieces. The organization of the material starts with the most unpretentiously designed, plain frontispieces without frames and without horizontally subdivided pages and ends with one-page or double-page frontispieces with illuminations in two well-defined different styles which can be subdivided into several under groups. The first of these styles is named “Omani” and the second “Persian influenced” The first style is characterized by primarily geometric ornaments, whereas vegetal forms and sophisticated designs distinguish the second. The origin of the second style can be easily traced back to Iran, most probably Southern Iran and there to the school of Shiraz. This style is closely related to the art of India Quran illuminations which doubtlessly had influenced Omani Quran illuminations too. The question of the origins of the fascinating first style, which has no equals in the Islamic world, can be answered in different ways and will be discussed in a separate subchapter.